Young stylish businessman walking on the street and enjoying good summer day. 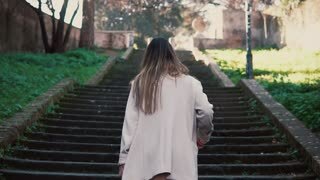 Young fashionable woman running up the stairs. Stylish girl walking in spring old town, bright sunlight in the morning. 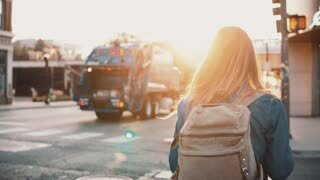 Back view of young stylish woman with backpack walking in downtown alone on sunset, enjoying view of cityscape.